Nothing illuminates a city more than a glass structure that is hit by natural light on a clear day when the sky is blue. Marking modernity and refinement in all major cities around the world, from New-York to London or from Paris to Tokyo, glistening glass skyscrapers and monuments have become a huge part of the city skyline. Whether it’s by reflecting light or diffusing it, with complex designs or plain, simple material, glass structures appear as a much more alluring alternative compared to its monotone concrete confreres. When it comes to glass structures here in London, it is hardly possible to think of any other before the 30 St Mary Axe (the Gherkin) which became one of the most recognizable features of London. However, glass isn’t only reserved for commercial skyscrapers. Nowadays, we can even find public institutions, houses, museums or even chapels predominantly built with glass. Although it might look more like a museum or an art gallery, this building is just the headquarters Basque Health Department located in Bilbao, Spain. Designed by Coll-Barreu Arquitectos, the use of angular glass and steel gives the building a particular and fascinating aspect. The glass façade also provides the building thermal and acoustic insulation while reflecting at the same time the surrounding buildings of the city. 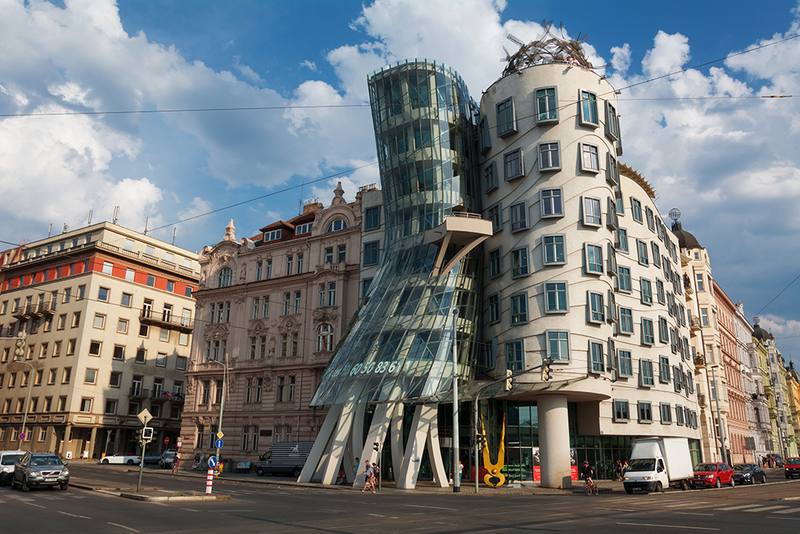 In a completely different style to the surrounding gothic buildings in Prague and outshining them in a certain way, the Dancing House is composed of 2 buildings, each named after famous American dancers Fred Astraire and Ginger Rogers. Ginger, the curved glass tower hangs into Fred, the concrete tower – both miming together a dancing couple. The National Grand Theater of China located in Beijing is a multi-functioning glass building completely made of glass and titanium. Designed by architect Paul Andreu, the building is surrounded by an artificial lake to form a dome with its own reflection in the water. 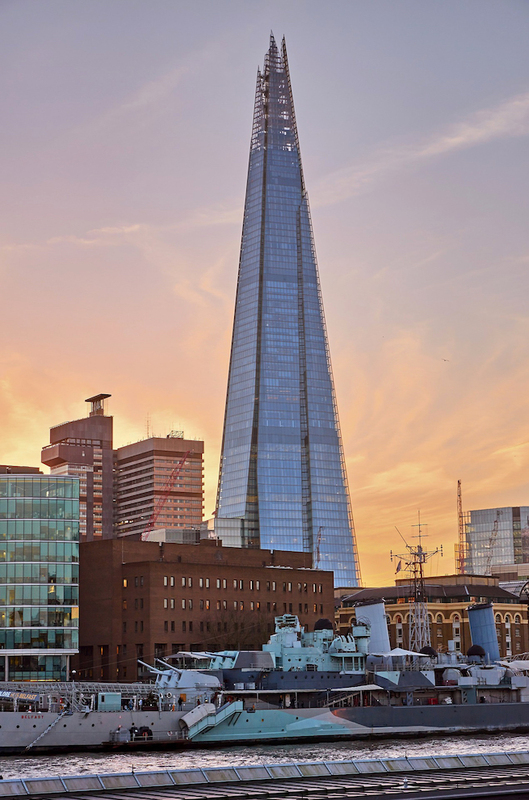 Formerly known as London Bridge Tower, The Shard is the tallest skyscraper in London. 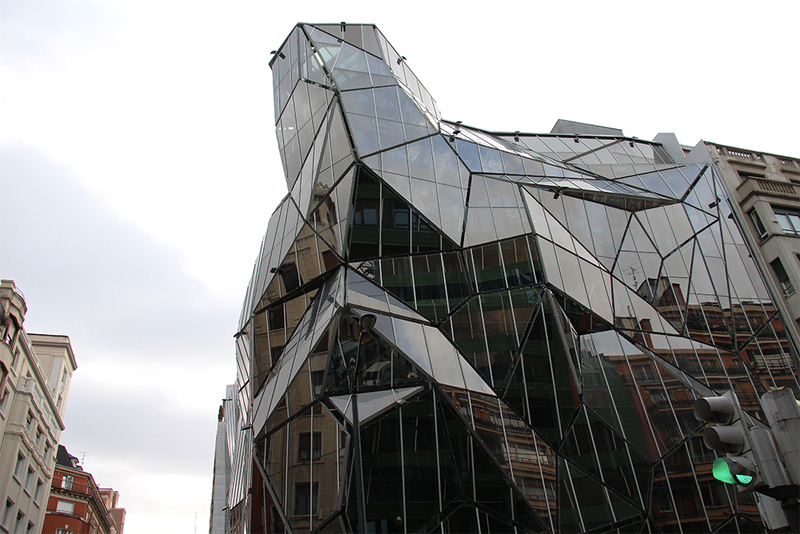 its angled glass facades reflect sunlight and depending on the weather its tint changes remarkably. 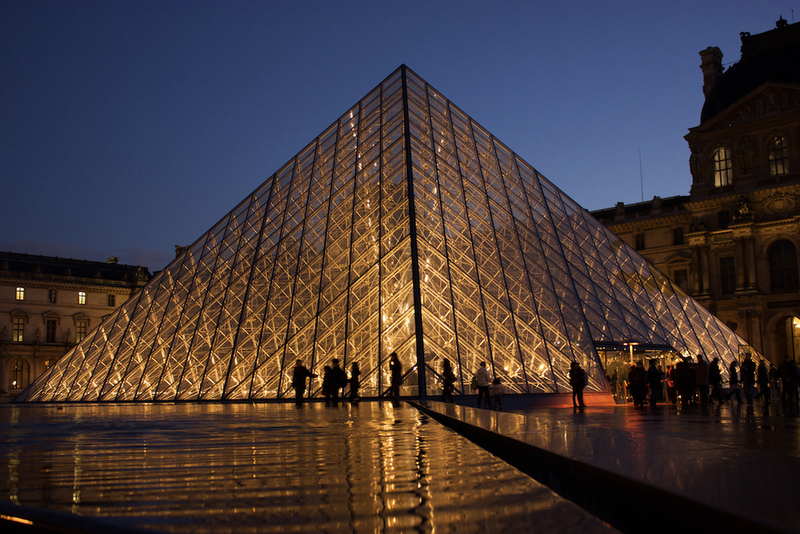 Laslty, standing 70 feet tall in front of the Louvre Museum in Paris, the pyramid du Louvre is a transparent glass structure designed by Chinese American architect I. M. Pei that consists of 673 glass sections from tip to base.